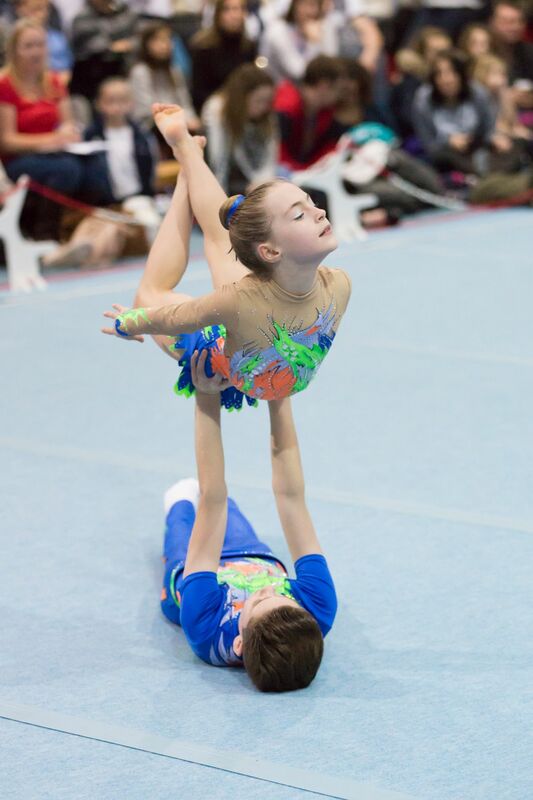 Acrobatic gymnastics is a pure fusion of strength, precision gymnastics, dynamism, power, expression and artistry. Acrobatic gymnastics has five disciplines – Women’s Pairs, Men’s Pairs and Mixed Pairs as well as Women’s Three’s and Men’s Fours. The uniqueness of acrobatics is that it offers the chance for children of different shapes, sizes and talents to achieve at a range of different levels. As a base gymnast there is a need for the child to be strong, powerful and taller, yet as a top gymnast the need is for them to be strong, flexible and slighter in build. Combinations of skills are executed within a routine and performed on a 12m by 12m sprung floor area; the gymnasts get to show off their strength, power, agility and expressiveness with three different types of routines. Balance Routines incorporate highly skilled and technically precise movements and shapes, of top gymnasts performing two and one arm handstands, static and moving balances on the base gymnast, who must demonstrate the strength and control to hold the top. Dynamic Routines involve tumbling for both gymnasts, as well as the top being thrown and caught in different somersaults, flips and throws by the base gymnast. The trust and courage from the gymnasts working together is a unique quality in these routines. Combined Routines involve a combination of the above two routines. 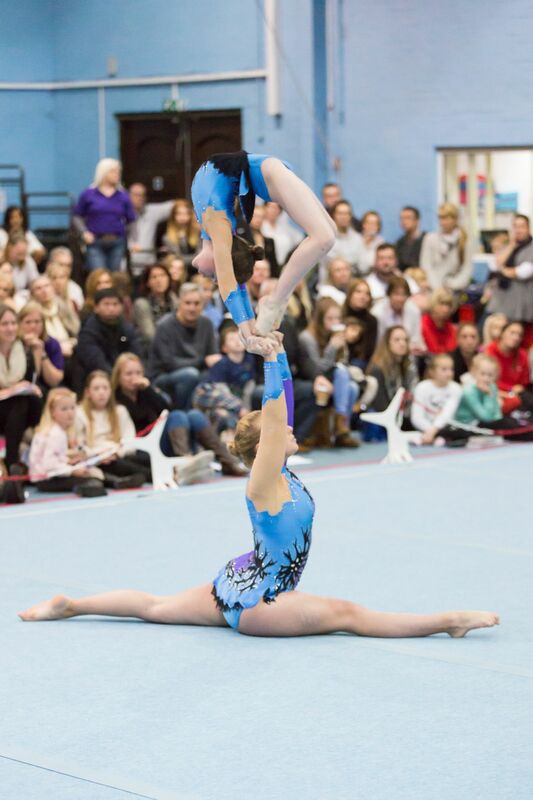 Within the grade system in the UK the younger gymnasts generally perform a combined routine, to support the learning of key elements without having to learn three different routines. Modern Acrobatic Gymnastics takes its origins from ancient Greek times where murals can be found of soldiers performing balances and somersaulting stunts as a part of their physical training. It was deemed that working together encouraged and improved team moral and spirit as well as showing off physical prowess. Having evolved into its modern form, acrobatic gymnastics still encourages the human qualities mentioned above.